Ballymena United have moved to strengthen their goalkeeping options by signing Dublin-based 22-year-old Tim Allen until the end of the season. Allen will provide competition for existing stoppers Dwayne Nelson and Stuart Addis and could make his debut against Cliftonville on Saturday. He moved back to Ireland from America before Christmas and was training with Shamrock Rovers before joining United. Allen retains ambitions of playing full-time professional football. He was born in Australia and played football there up to college level before gaining a scholarship at the University of Albany, New York. Tim completed his studies there and played for the university for two and a half years, also playing as an amateur for the Carolina RailHawks Under-23 side. "I'm thrilled to be playing over here. It's been a dream of mine to get into a football league in Europe and this will help me push for my ambition of full time professional football," said Allen. "Speaking to Glenn (Ferguson) and some of the officials we are looking to strengthen the defence and I'm hopefully here to add more competition and solidity at the back." Ballymena have received international clearance for the player and are awaiting confirmation from the Irish FA as to whether he is eligible to take part in the Irish Cup sixth round game against Cliftonville at Solitude. 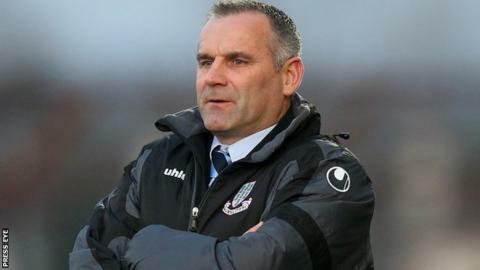 "I'm delighted to have signed Tim as he comes highly recommended and I know he's excited at signing for us after his visit to the Showgrounds on Saturday," added manager Ferguson.